PROF / TRAC offers an Open Training and Qualification Platform for professionals dealing with nearly Zero Energy Buildings. The PROF/TRAC Qualification Scheme on nZEB skills targets professionals with a higher education degree in the construction sector. It constitutes a solid basis to compare the nZEB skills requested to different professions across Europe and to the same profession from one country to the other. Are you a building professional? Attend the PROF/TRAC Train-the-Trainers free online course and update your skills with an advanced training in nZEB design. The repository collects and structures available educational and training material from recent European projects, international and national initiatives about nZEB design, construction and operation. PROF/TRAC team welcomes any expansion of the repository with the new resources. 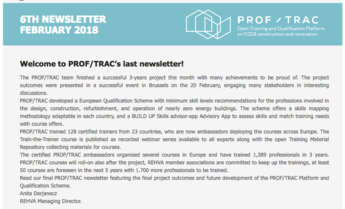 Read our final PROF/TRAC newsletter featuring the final project outcomes and future development of the PROF/TRAC Platform and Qualification Scheme. Check out the PROF/TRAC Youtube Channel! 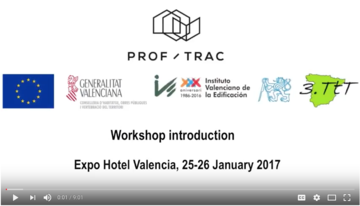 Don't miss the PROF/TRAC seminars, now available on the Youtube Channel. 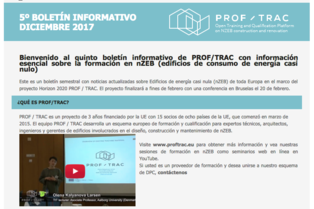 Final PROF/TRAC Conference: "European multi-level skills offensive: the key to ensuring public support for the energy transition"
Thanks to project partner IVE we have now a Spanish version of the latest newsletter. Welcome the new PROF/TRAC certified Trainers! This project has received funding from the European Union’s Horizon 2020 research and innovation programme under grant agreement No. 649473. The sole responsibility for the content of this website lies with the authors. 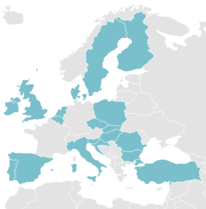 It does not necessarily reflect the opinion of the European Communities. The Executive Agency of Small and Medium Enterprises is not responsible for any use that may be made of the information it contains. 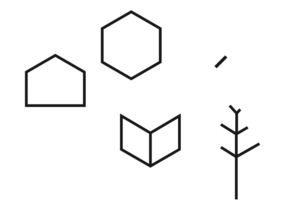 any duplication or use of objects such as diagrams in other electronic or printed publications is not per- mitted without the author’s agreement.